Everybody travels to Ronda in Spain to see the famous bridge of Ronda. But where to find the best view of the Ronda bridge? I give you 2 proven self-drive routes around Ronda with a route, a Ronda map and insider tips on how to get there. A practical guide to find the best view of Ronda Spain and the Ronda Puente Nuevo bridge. Ronda, the lovely white village located in the south of Spain. I could write a love letter to it. What a remarkable little town. Situated at the edge of a cliff, it draws visitors in with her gorgeous bridges. The most famous bridge is the stone bridge of Ronda, the Puerto Nueva. It connects medieval Ronda with “modern Ronda”. But the best view of Ronda is not by standing on this bridge. No, I found a route around Ronda to see the village from its best side. And I share two of the scenic self-drive routes for the best view of Ronda with you! Who doesn’t know this famous image of the old bridge of Ronda? It is iconic of the pueblos blancos (the white villages) of Spain and seeing this bridge is on many people travel wish list. It also was on mine. The Puente Nueva Bridge (New Bridge) was built in 1793 AD and connects Ronda from Moorish times with the more modern village of Ronda. 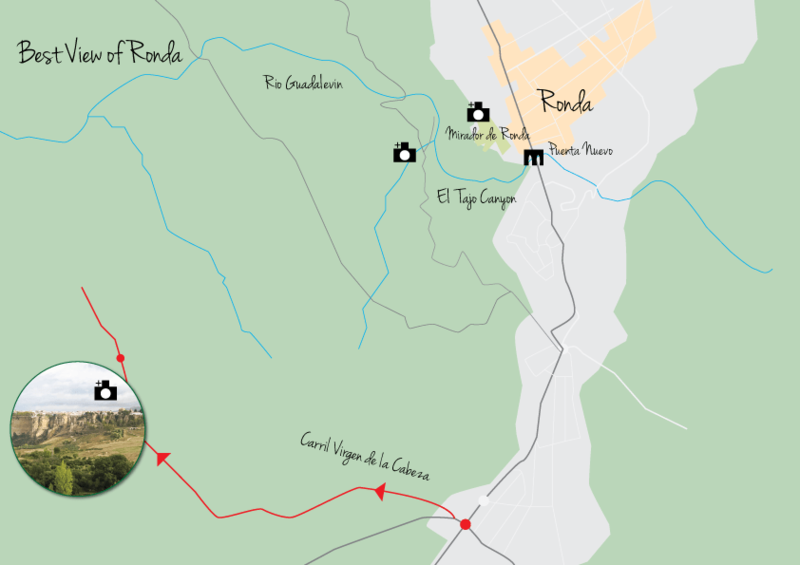 Both parts of Ronda are divided by the El Tajo Canyon and the river Guadalevín. The New Bridge is one of three bridges in Ronda. You can also find the Roman Bridge (Puente Romano or Puente San Miguel) and the Old Bridge (Puente Árabe or Arab Bridge). I included Ronda in my Andalusia Road Trip Itinerary and approached the city from the east. In my mind I would drive up to Ronda and see it edged up on the cliffs above me. No such thing. The first time I saw the famous bridge of Ronda, it was when I was standing on top of it. It was already getting dark and starring into the deep gorge below me, didn’t give me that amazing image of the bridge of Ronda. So the best view of Ronda wasn’t from the city itself. I searched my guidebook but the section about Ronda didn’t mention the best way to see Ronda. I googled and I found a few stories about hiking in Ronda to the bottom of the gorge. After my previous stories of hiking in Montserrat and in Colca Canyon, Peru, I was reluctant to take on such adventure. If you do feel adventurous, check out the via ferrata info in Ronda from Wanderlustingk. Looking down into the canyon. Ever wondered how to get down below? My Route 1 takes you there. As I travelled by car, I thought to take advantage of it. I drove to the area of San Sebastian and turned into a dead end road. It was very steep, more cobble stones than road, but when I reached the bottom of the gorge, there was some sort of car park (-ish). And what a view! I cannot tell you how amazed I was. I could see the Parador on the left of the cliff, people on the bridge and some adventurous hikers where coming down from the right. But I felt all alone in the world. Just the birds and the sound of the river Guadalevín. This was it! The best view of Ronda with the iconic image of the Ronda stone bridge in front of me. You can find the route from the image below. You need to programme your navigation for Calle Prado Nuevo which is in the area San Sebastian. Route 1: Calle Prado Nuevo. You can click the image to get a bigger view. After I snapped numerous pictures I got back into my car and reprogrammed by navigation. Or better, I drove back, took a right, 2nd roundabout right, right road and kept driving. This was all I knew from the route that I studied meticulously the night before. Would I recognize the route around Ronda from google street view? I did! It was exactly as I planned it and I continued on a dirt road to the best views of Ronda. I was on the hills across from Ronda, looking at the village and her bridge. The scenery wide and green, giving me the best view of Ronda! The weather was very unpredictable this morning, grey clouds threaten to unleash their November rains so I took advantage of the little time I had. You can find the route from the image below. You need to programme your navigation for Calle Virgen de la Cabeza. Route 2: Carril Virgen de la Cabeza. You can click the image to get a bigger view. If you also want to enjoy these amazing views of Ronda, follow the directions I gave in this post to find these by car. Of course, you can always continue to explore more on foot. Have you been to Ronda? What was your favourite view of Ronda? Let me know in the comment section below. 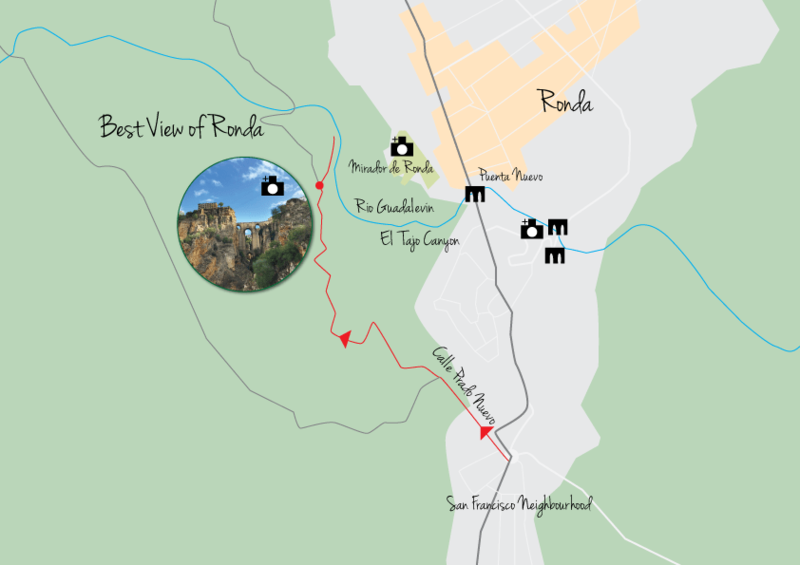 Have you tried my routes around Ronda? Let me know how you liked them! Love to go to Ronda? Pin it! Thanks for the tip! We were in Ronda today and wanted to find out how to get down to the bottom. Your’s was one of the first results on Google. Amazing views! A bit of trial and error to find the spot, but well worth it! Thanks Becca. Glad you found it and enjoyed it! Ronda is so lovely. Followed your route #1 today. We did not realize that the cobbled road you show on your map is just to your left as the hill climbs to Ronda in front of the castle. Take the next right from the roundabout as you pass the right turn to head up the hill into Ronda. It is almost like pulling into a parking lot…so easy to miss. A professional videographer was there with several drones liking your spot! Hi Brandon, how cool that you was there today! It is indeed very easy to miss and cars are parked there and it almost doesn’t seem like a road. Glad you managed to find it. Incredible place to have fun! I loved view from Ronda bridge. I truly enjoyed reading the post & have added this place in my bucket list. Thanks for sharing. Spain is one of my favorite countries to visit, so I’m definitely partial to its views! The bridge in particular looks amazing and the plains too. Will have to check this out one day! I hope you do Leah! Let me know what you thought about it. The view from the Bridge of Ronda looks so breathtaking! Wow! Andalusian trip in 2013 is still my favorite trip ever. Unfortunately, we needed to skip Ronda and Gibraltar to visit some other places, but I will definitely go back. The village is amazing! I had to do some tough decision making myself too Maja! But.. I solved that! Will go back in 2017 myself.